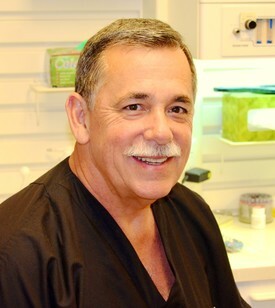 Dr. Jon Mark Thompson is a native of Cape Girardeau, Missouri. He attended the University of Notre Dame where he was a member of the men’s soccer team. Upon graduating, his education continued at Virginia Commonwealth University School of Dentistry. After earning his DDS degree, he completed an Advanced Education in General Dentistry (AEGD) residency program at the University of Florida where he learned to treat complex comprehensive dental cases, difficult root canal cases, and place implants among many other skills. He moved to Nashville in 2013 and has been practicing in private practice and volunteering at the Interfaith Dental Clinic ever since. He enjoys traveling and almost any outdoor activity one can imagine, but particularly hiking, snow skiing and boating. His biggest supporter and partner in all of his life ventures is his wife, Paige. They have two daughters, Amelia and Quinn, and one larger than life dog, Gunner. Paige is also a Missouri native, loves all things related to design, and is employed at GS&F as an Associate Creative Director. Moving forward, his training and continued education will allow him to carry on the tradition of excellent care and even add services such as orthodontics and the treatment of TMJ disorders. He is a member of the American Dental Association, Tennessee Dental Association, and Nashville Dental Society. He is fellow eligible in the International Congress of Oral Implantologists and is actively working to attain his fellowship in the Academy of General Dentistry. Dr. Cisneros is a member of the American Dental Association, the Tennessee Dental Association, the Nashville Dental Society, and the American Society of Forensic Science. He is a Fellow of the American Academy of Forensic Science. He also serves as a member of the Region IV D-Mort Team under USPH, and as the Associate Odontologist for the Office of the Medical Examiner in Nashville, Tennessee. Dr. Cisneros served on the the Postmortem Team in New York City after the World Trade Center and American Airlines Flight #584 disaster performing dental identifications. After the major earthquake in Haiti, Dr. Cisneros served as the Dental Section Leader for the Forensic Odontology team in Port Au Prince. He and his staff are continually educating themselves on the lastest dental techniques and approaches in order to provide you with advanced, state-of-the-art, comfortable and personalized superior care. Please email Dr. Cisneros at DrC@smilesofnashville.com with any questions or concerns you might have.